We live in an area of South-East Queensland known as The Redlands, so named for its volcanic red soil. The large number of fruit and vegetable farms in the area gave it the name of "The Salad Bowl of the South-East". Sadly, many of those farms have been taken over by so-called progress, as housing developments have infiltrated the once beautiful rural scene. The Redlands is also a noted koala habitat and the local government continues to be pressured to retain tracts of land for these beautiful creatures. I never cease to thrill at the sight of a koala resting in the fork of a gum tree. Sometimes if I call to them, they raise their sleepy heads as if in greeting before settling back into what appears to be a rather uncomfortable and somewhat precarious sleeping position. Just a few weeks ago my young nephew, Andrew, was visiting. One morning in the park near our house we spied a koala curled like a camouflaged bump in the fork of a large gum tree. Late that afternoon Andrew set off to see if it was still there. When he didn't return after some time, I followed him to the park where I could see neither my nephew nor the koala. On calling Andrew's name, he appeared from the other side of the tree, motioning me to be quiet. "Where's the koala?" I whispered. "Here", he said, "I'm feeding him." "Oh, sure thing Andrew", was my disbelieving reply. He beckoned me over. Right next to the gum tree was a leafy sapling no more than 2m in height. Lodged in its young branches at eye level to us was the koala seemingly unfazed by our presence. 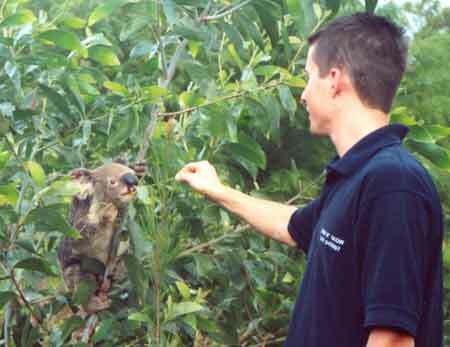 Andrew was feeding it new leaves he had plucked from smaller adjacent saplings and the koala was obviously enjoying their sweet young taste. For about 10 minutes we shared a rare encounter with this endearing animal in the wild. Its brown eyes showed no sign of fear as it eagerly grasped our offerings. It was a magic moment in time when our world stood still. On my daily walks around our suburb there are few occasions when I fail to see a koala. Such sightings never fail to bring a sense of wonder and humility together with the knowledge that the preservation of natural habitats for wildlife within the demands of urban sprawl is of greatest importance.